¯ Shelly M. Anthony, 42, of Jamestown was charged with petit larceny. Officers responded to Tops Markets at 4:40 p.m. Saturday for a reported shoplifting. An investigation found Anthony had allegedly taken merchandise from the store without paying. Anthony was taken to the Jamestown City Jail and held pending arraignment. ¯ Scott L. Foster, 38, of Jamestown was charged with second-degree unlawful imprisonment, endangering the welfare of a child and second-degree harassment. Deputies responded at 3 p.m. Saturday to the area of 125 W. Virginia Blvd. for a reported of a domestic dispute. Officers found a female victim who had been involved in a physical altercation with a man who fled the area. The man, identified as Foster, allegedly restrained the woman in a car and got into a physical altercation with a 4-year-old child present. Foster returned to the scene and was taken into custody without incident. He was transported to jail and held pending arraignment. ¯ Kylah Seiberg, 23, of Jamestown was charged with second-degree obstructing governmental administration, resisting arrest and seventh-degree criminal possession of a controlled substance. Officers were on patrol at 7:33 p.m. Sunday when they observed Seiberg near McKinley and Forest avenues. Seiberg had a valid bench warrant, and when officers attempted to stop her she refused and walked away. She resisted arrested when placed into custody, and a search found she was allegedly in possession of methamphetamine. She was transported to Jamestown City Jail and held on her original warrant. ¯ POMFRET — Sheriff’s deputies responded at 9:16 p.m. Saturday to Route 60 in Pomfret for a motor vehicle crash with injuries. An investigation found a 46-year-old Fredonia man was northbound on Route 60 when he struck a deer, causing him to crash. He was taken to ECMC in Buffalo, while a female passenger was taken to a local hospital, the Sheriff’s Office reported. No charges were expected in the crash. 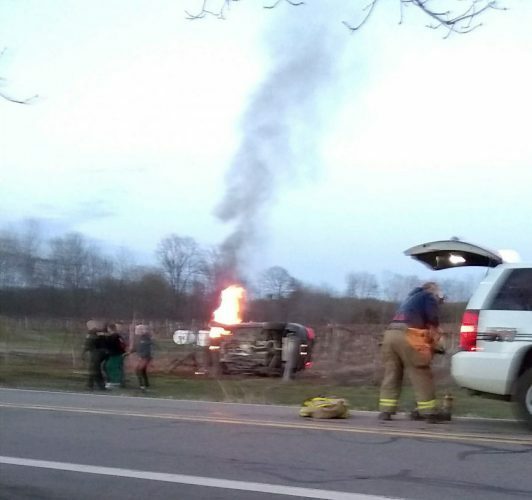 Deputies were assisted by New York State Police, Fredonia firefighters and ALSTAR EMS. ¯ BEMUS POINT — Nancy Y. Cala, 63, of Bemus Point was charged with fourth-degree criminal mischief and disorderly conduct. Deputies responded to a reported altercation Saturday at 9:19 p.m. in Bemus Point. An investigation found Cala had damaged property belonging to another person. She was taken into custody and transported to the Chautauqua County Jail on $500 pre-arraignment bail. Cala is scheduled to answer the charges in Ellery Town Court at a later date.